Advantages of piers constructed monolithically, i.e. integral bridges with the bridge deck over usage of bearings? Bearing replacement is one of the direct cost involved in the maintenance of bridges, and the one which worries the contractors. Using integral bridge systems, this can be avoided. In design point of view, bearing replacement introduces additional stresses and requirement of diaphragms in transverse design. Movement of the bridge deck is achieved by the bending deformation of long and slender piers. In this way, it saves the construction cost of bearings by using monolithic construction between bridge deck and piers. Moreover, it is not necessary to spend extra effort to design for drainage details and access for bearing replacement. On the other hand, in maintenance aspect substantial cost and time savings could be obtained by using integral bridge construction instead of using bearings as bridge articulation. In two span integral bridges, temperature, creep and shrinkage, and other loads that contributes to longitudinal forces like seismic forces are major design challenges. These forces induces additional moments on the central pier increasing the demand. 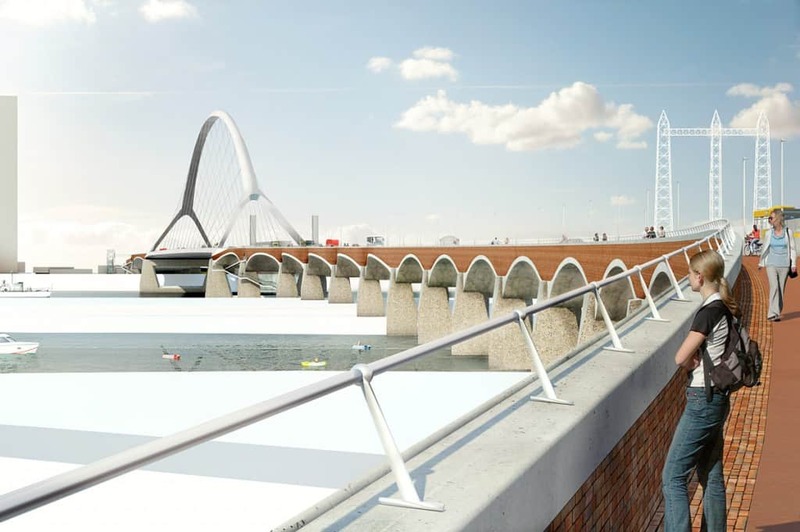 This necessitates innovative solutions in the design, like adoption arch systems which allows the bridge to breath up and down due to thermal actions. Uncertain soil conditions and seismic zones add up the design challenges. Integral Bridge design is an expert area in the design of bridges. Note: Monolithic construction means that piers are connected to bridge decks without any joints and bearings. Approaches of De Oversteek Bridges are one of the longest integral bridge systems in the world. The state-of-the-art technologies and ideas where used in the design. 1 Advantages of piers constructed monolithically, i.e. integral bridges with the bridge deck over usage of bearings?